Trees and flowers are popping colors here in Alabama, and I hope they push Winter into next year fast! I always get that thrill or "rush" of Spring when the robins (literally hundreds of them) fill the front pasture, the trees get fuzzy with new growth, and yellow daffodils pop out everywhere. The bare starkness of a very cold season is soon to be a distant memory. Joy, joy! 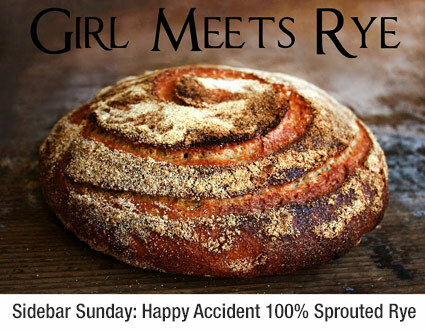 You'll find the best "bread by mistake" recipe using our sprouted rye and spelt at the Tartine Bread blog. My gluten-free recipe this month is a great way to cook sprouted black beans. We hope to add to our sprouted legume offerings in May. Francis-Olive reminded me in this post that you don't have to over think bread making. Sometimes our blunders can end up blessings. I'm sure this recipe will be one to add to your repertoire of great breads. This recipe is great using our sprouted black beans. Although our beans are sprouted, they have been dehydrated so you'll need to soak them to rehydrate before cooking. This will lessen your cooking time. Sprouted beans will also hold their shape and be slightly chewy due to the starch reduction during sprouting. Place sprouted black beans in large bowl and cover with filtered water at least 3 inches above beans. Let beans soak at least 24 hours to reduce cooking time. Drain beans and transfer to a large Dutch oven. Add 3 cups of cider or juice. Bring to a boil over medium heat. Gently boil, uncovered, stirring occasionally, for 1 hour. Remove from heat. Drain, reserving liquid. Layer half of thick-sliced bacon on the bottom of Dutch oven or bean pot. Spoon beans on top. Nestle onions in beans. Heat syrup, mustard and salt until salt dissolves. Pour mixture over beans. Top with remaining bacon. Add reserved cider liquid. If necessary add water or additional cider (I add more cider) to cover all. Cover bean mixture and bake at 300 degrees for 3 hours, adding cider as needed. Bake 2 more hours until beans are tender. For the home or professional bread making enthusiast, you should consider a membership in the Bread Bakers' Guild of America. Their mission is "to shape the knowledge and skills of the artisan baking community through education." 2. www.mysmartpasta.com - Anthony shared the following testimony and sauce recipe for his fresh, sprouted pasta. "I just enjoyed a hearty and satisfying meal with your pasta. It tasted better than any fresh pasta I've ever eaten." Directions: Dice all veggies and mince garlic. Add olive oil to skillet. Add garlic and saute until golden. Add veggies and saute until cooked down. Add 1/2 cup of crushed plum tomatoes. Stir and bake in 350 degree oven 15-20 minutes. Serve over Anthony's sprouted pasta of choice.